Apple-bashing from Samsung is nothing new, particularly given the ongoing court hearings between the two relating to supposed theft of patented technologies, but in a rare treat, the Korean outfit has taken a swipe at Apple, Microsoft and Amazon in one fell swoop with its latest Galaxy Pro Series Ad. The Galaxy Tab Pro and Galaxy Note Pro, which Samsung was heavily pushing at Mobile World last month, offer quite a few features built with the power user in mind, and with the advertising machine in full flow, the company has wasted no time in having a swipe at the Apple iPad, Amazon Kindle Fire and Microsoft Surface for their respective shortcomings. 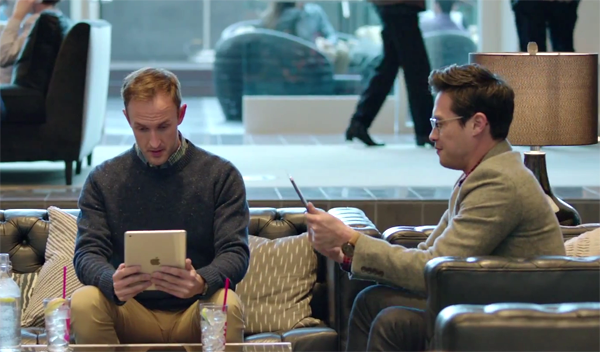 The ad is entitled ‘It Can Do That,’ and follows the tried-and-tested format of placing Galaxy Pro device users alongside their iPad, Kindle and Surface-using peers. As you might expect, each subject is left in awe of the Galaxy Note Pro and Galaxy Tab Pro’s capabilities, and this goes on for a full minute. Considering the amount that Samsung spends on advertising, this effort seems somewhat lazy, and does very little to inspire a consumer to purchase a Tab Pro or Note Pro. Indeed, if Samsung channeled as much energy into properly showcasing its own products rather than taking a dig at others, you feel it would be more competitive with Apple in tablet space, and for one thing, we wouldn’t have to endure these rather tired, one-dimensional ads. At this point in time, Samsung remains the only major OEM to have made a concerted push into the pro tablet market. The Microsoft Surface Pro, which, like a number of Windows 8 slates, can run legacy apps, is probably the closest product to achieving this, but with Samsung’s Pro range offering much larger displays and features such as Multi Window, it certainly has the potential to make a lasting impression on this area of the market. Speaking of which, there has also been plenty of speculation pertaining to Apple’s supposed ‘iPad Pro’ efforts, with the Cupertino said to be prepping a slab that will, in the eyes of many, complete its famed tablet range. With a large, ~12-inch display, we’ve seen an abundance of concepts relating to the product, which some have suggested will arrive later on in 2014, although with precious little by way of evidence that the device is actually in production, we’re not holding our breath. Still, where there’s an opportunity for Samsung to claim one-upmanship on its closest rivals, you can bet your last buck that it will take full advantage, and you can check out new Galaxy Pro Series ad via the embedded video below.